A grey stone sculpture of a bear, sitting on top of a cylindrical pillar, which has a trumpet-shaped foot. The hollow pillar is visually divided on the outside by two imitation rope-twist bands in the middle. 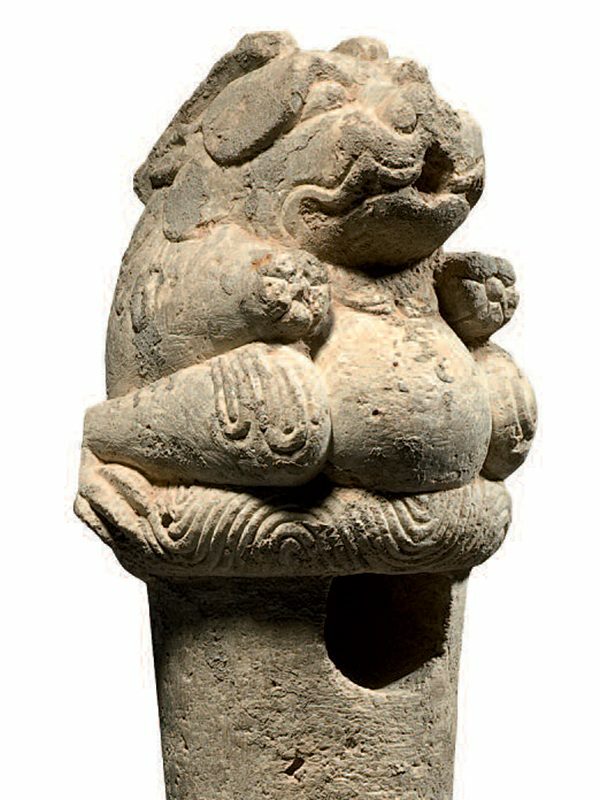 A horned bear sits on top of the pillar on a round mat. His hind legs with long-clawed feet are held wide apart to accommodate his protuberant belly. His arms are stretched forward. The bear’s head is well defined with hooded, bulging eyes, short snout, snarling lips and pricked ears. The hollow shaft has a circular aperture near the top. The interior of the concave base shows linear carving marks. This exquisitely carved stone sculpture of a bear is of a type known in China as yunren (literally meaning ‘iron man’). It was designed specifically to hold a flat metal plate for ironing fabric or clothes, so is an extremely rare ancient Chinese example of a stand to hold iron tools. 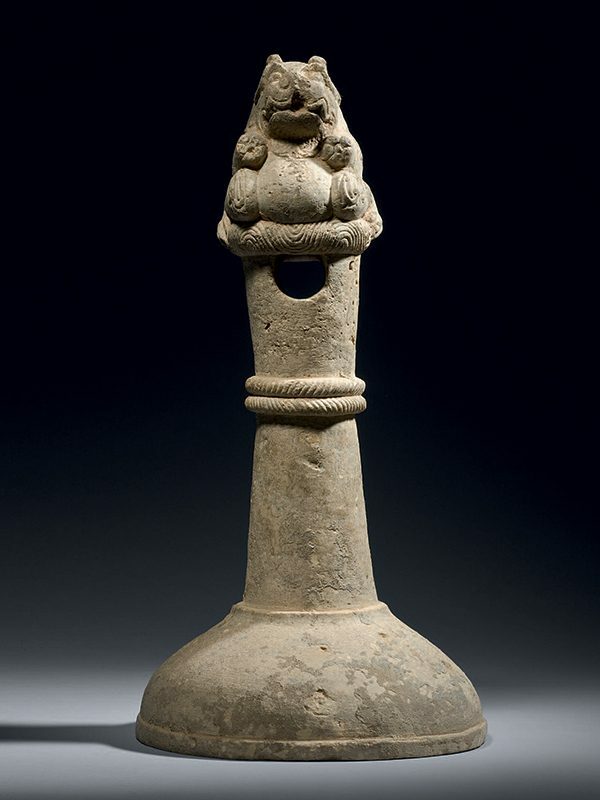 Due to their extraordinary rarity, they are often misidentified as Han dynasty lamp stands, which have a similar form. One such green.glazed pottery lamp, with comparable flared base and a stylized bear decoration on the shaft but with an oil container on the top, is in the collection of the Shanghai Museum. Iron holders in pottery and occasionally in stone, designed to hold a long-handled, circular pan-shaped iron, were fashioned during the late Eastern Han (25 – 220) to Jin dynasties. Three closely comparable pottery iron holders of similar proportions and with stylized bear finials, all dated to the Jin dynasty, were excavated from Henan province (Fig.1). An iron holder of comparable form but with a more slender shaft, dated to the Han dynasty, was excavated from a tomb in Hebei province.